Randy Frey and Jerry Moses want to lay out the red carpet to their customers - literally. In November, the two Fremont natives started their own business, Fremont Floor Covering Outlet, LTD, 218 N. Front Street. 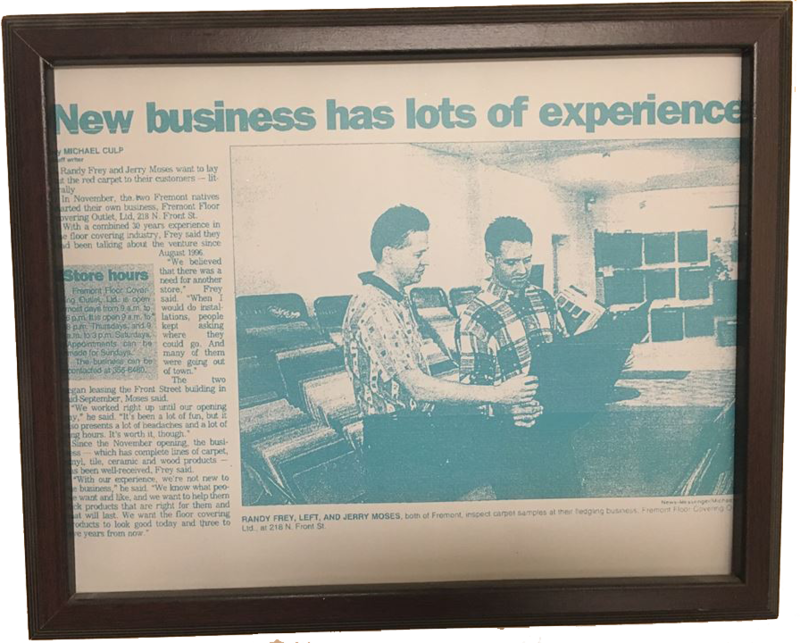 With a combined 30 years experience in the floor covering industry, Frey said they had been talking about the venture since August 1996. "We believed that there was a need for another store," Frey said. "When I would do installations, people kept asking where they could go. And many of them were going out of town. The two began leasing the Front Street building in mid-September, Moses said. "We worked right up until our opening day," he said. "It's been a lot of fun, but it also presents a lot of headaches and a lot of hours. It's worth it, though"
Since the November opening, the business - which has complete lines of carpet, vinyl, tile, ceramic and wood products - has been well-received, Frey said. "With our experience, we're not new to the business," he said. "We know what people want and like, and we want to help them pick products that are right for them and that will last. We want the floor covering products to look good today and three to five years from now."